Stranger Things has essentially become Netflix’s flagship series, and now the core cast of the show is getting a pay bump that seems commensurate with the amount of Stranger Things Funko Pops and novelty shirts that are filling up that weird back wall of your local Target. 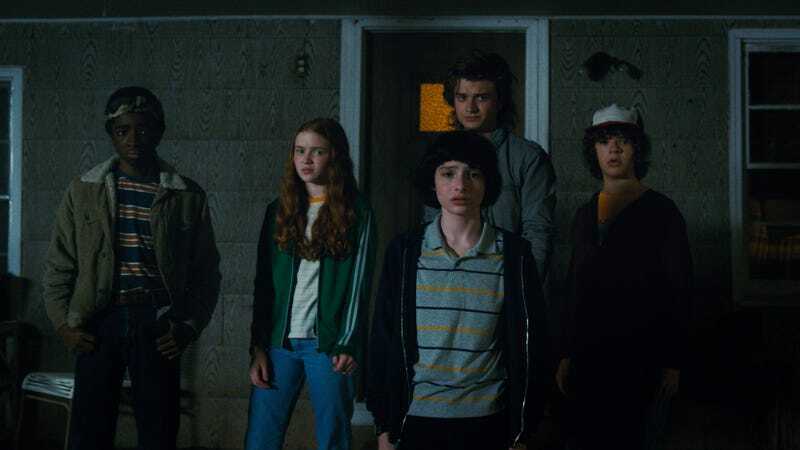 According to Deadline, the leads of Stranger Things—both the kids and the adults—have secured big raises, with Finn Wolfhard, Gaten Matarazzo, Noah Schnapp, and Caleb McLaughlin (the main boys) all reportedly going from about $30,000 per episode to somewhere between $200,000 and $250,000. Millie Bobby Brown’s bump was apparently even bigger, but Deadline doesn’t offer specifics. David Harbour and Winona Ryder are still making more money than the kids, possibly heading somewhere “north of $300,000" after their own salary bumps. Series regulars Natalia Dyer and Charlie Heaton are only making between $100,000 and $150,000, which seems low for important they are to the series, but they did both get overshadowed a bit by Joe Keery during season two. Who knows, maybe things would be working out even better for them if there was more Target merchandise featuring Nancy, Jonathan, and Steve.